Today Balinese Hindu religion, celebrate Pagerwesi Day. Pagerwesi day is part of a major holiday in Bali's Hindus, who are always there on Wednesday, every 210 days. And is part of the Saraswati day, also takes place once every 210 days, on Saturday. Saraswati is the feast day of the Lord's descent science to mankind. So on that day, Balinese Hindus celebrate it with utter gratitude to God for having given intelligence and knowledge, so that they can live well and this world. While the Pagerwesi meaningful to improve the firmness of faith and to pray to the Almighty God for the world and its contents are given salvation. On this Wednesday in Bali, all activities of the government offices and schools were closed. With the goal, so that all Balinese Hindus perform religious rites in peace, and walked with linear. Because the Balinese Hindus, this day is a very big day. 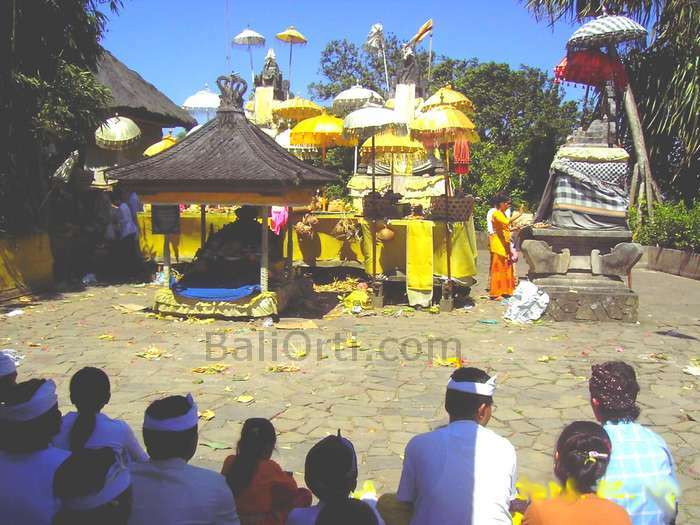 Every Pagerwesi day in Bali, all Balinese Hindus perform religious rites in their homes. Conducted since early morning till noon. There is a belief for Balinese Hindus, ancestors descend into the world of heaven only in the morning, and returned to heaven at noon. Just like other rituals in Bali, on the Pagerwesi day, also held a religious ceremony to deliver to the offerings as well as a series of leaf, flower and fruit in the family temple (Merajan). Because the family temple (Merajan) is an ancestral place is down to earth, so the family temple is part of the highly purified. In addition to praying at the family temple, Balinese Hindus also pray to be some nearby temples. Pagerwesi day is actually a normal working day in Indonesia, but Bali Governor grant a dispensation to all employees who are Hindus, and dismiss students to perform a series of rituals. So on this day, many people capitalize on this holiday to visit relatives. So long ago, visiting relatives and family activities at this Pagerwesi Day has become a tradition for the people of Bali.